This paintball game is set amongst some dense, dark and damp woodland. Both teams must work their way through the field, avoiding the sinking sand and swamp patches - once your in them you'll at the mercy of the enemy. Good teamwork and communication will ensure that players stay on solid ground and are able to manouvere through the jungle terrain unscathed. A very tactial paintball game where you'll need your wits about you. Capture the Flag in an area of 50 metres square and there is a base at each end, and you have to battle your way through village to capture the oppositions flag and return it to your base. This is a great paintball game to use smoke bombs, paintball grenades and thunder flashes (over 18’s only). Really fast and furious with close paintball battles taking place through the woodland. Use the cover well as this will protect you from the opposition fire. This game zone is home to the impressive Fort where many paintball battles have taken place and heroes have been made. One team has to defend the Fort whilst the other attacks it form all angles. Both paintball teams have a chance to attack and show their skills and bravery. Teamwork is essential in this paintball game as you will need to cover your comrades back as the firepower starts to hot up!! What lies between you and your paintball enemy is a undulating area of Eastbourne woodland. Once in this area of mounds you'll need to be alert as the opposition can sneak up on you totally un-noticed and take you out the game. Work with your team-mate to flush the enemy out into the open and eliminate them to become victorious. Bedlam Paintball Hailsham. The best paintballing deals in Hailsham. 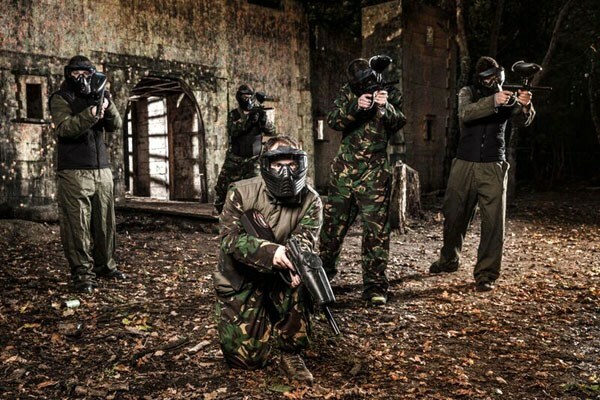 Go Bedlam Paintballing Hailsham is a pay as you go package to play paintball in Halisham . The package includes entrance fees, game fees, paintball insurance, paintball marker gun, paintball hopper and propellant for the whole day. EASTBOURNE'S PREMIER VENUE; Cinderford Lane, Hailsham, East Sussex, BN27 4HL.